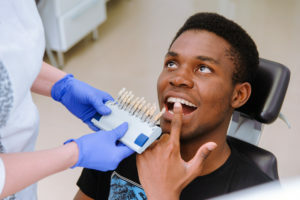 Because these causes of staining are typically not treatable with traditional teeth whitening methods, you may need to work with your cosmetic dentist to plan for more advanced treatments. Direct bonding or porcelain veneers are often good options to whiten teeth when traditional methods would be less effective. At Framingham Premier Dental, we offer a wide range of cosmetic dentistry services to deliver brighter, straighter, and more perfect smiles. Whether you’re in need of traditional teeth whitening services or a complete smile makeover, we’re here to help. To learn more, call our team to schedule a cosmetic dentistry consultation in our state-of-the-art Framingham dentistry practice today. We look forward to seeing you soon.